The second model in Bowtie Promotions' lineup that supports the OTG protocol is fitted with two plastic caps and metal jacket for versatile branding. OTG or (On-the-Go) USB flash drives work just like any other flash drive with a standard USB connector. The OTG USB flash drive also offers a micro USB connector for mobile phones or tablets in addition to the standard connection to a computer. It’s easy to extend mobile device capacity or transfer files to a colleague by simply plugging the Mobile OTG CS flash drive into a mobile phone or a computer. Most modern mobile phones and tables from Samsung, Sony, LG, and Google support the OTG protocol to enable connectivity to the OTG USB flash drive. Mobile phones such as Samsung Galaxy S6, Sony Xperia z3, Google Nexus 6, and LG G4 are some of the devices that support the OTG protocol and may be used to store data onto the OTG USB flash drive. On many occasions it’s easier to transfer presentations to a compact flash drive to share with co-workers or customers. Most occasions still require spelling long email addresses; the USB OTG Mobile CS drive is a perfect solution. The Mobile OTG CS USB flash drive has a standard USB connection on one end of the device, and micro USB on the other end. The drive offers a large surface area that can be silk screen printed front and back in color or laser engraved. The clear caps enable easy identification of the connectors. 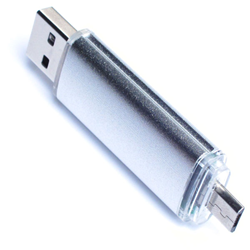 The Mobile OTG CS USB flash drive can be configured with a capacity from 128MB up to 32GB. Bowtie Promotions is a registered trademark of Bowtie Promotions Incorporated. iPhone is a registered trademark of Apple Incorporated. Android is a trademark of Google Incorporated. Microsoft is a registered trademark of Microsoft Incorporated. XPERIA is a registered trademark of Sony Incorporated.